Would like to start out by saying that this is not my scope. It's my girlfriend's, and she got it a while ago. I'm trying to make use of what she has. 1. The scope is somewhat out of collimation, which is affecting the images. 2. There is a large amount of spherical aberration. The secondary looks HUGE out of focus (around twice the size it should be) and rather small when inside focus, so that would indicate overcorrection. I have read up on the manual and will try collimating it the next chance I get. The question is, will collimating it fix the SA? I'm guessing that if the corrector is not on-axis it may not be functioning as intended. If the SA stays even after it's collimated (which would mean an outright figure defect), I'm afraid the scope is near useless. I do not know why Vixen made these scopes. They sure look nice but you would never buy another Vixen after using one of these. Maybe they are good for daylight spotting scopes. Edited by Starlease, 20 October 2018 - 10:10 PM. Collimation fixes alignment and resulting aberrations, NOT spherical aberration. With a regular scope, yes, but this thing has a sub-aperture corrector attached to the secondary. Wouldn't misalignment alter the performance? 1. What do you mean by ,,secondary looks huge"? Secondary diffraction ring? 2. I have the bigger VMC 110L and it gave me unforgettable views of this year's Mars opposition. 3. Collimating will not correct for spherical aberration. However, you shouldn't throw in the towel yet. Your fuzzy ball image may well be the result of miss collimation and not so much spherical aberration. Can you please report if you can see your miss collimation represented in either one of the outlined methods above in the link. The thing is I cannot see my telescope in any way missaligned (doing the indoors test see link above). 5. However on the star test it is different. On one site of focus on a star I have perfect collimation (at 128x magnifcation) but on the other side it is ever so slightly out of collimation. Maybe it is the design of the Ploessl eyepiece (I tried it with a Sky-Watcher at 138x and a Vixen NPL at 128x). I also tried it without the flip mirror and straight look through configuration. I am planning to buy a Cheshire collimating eyepiece. Edited by Magnetic Field, 21 October 2018 - 02:03 PM. Tried collimating it. It's a nightmare to collimate, the collimation drifts all over the place, and the SA is still there (I was dumb to think collimating would fix that). The Cassini division is invisible even when perfectly collimated. Syrtis Major was incredibly hard to see on Mars and I can pick that out with my 50mm Galileoscope. What a piece of junk. How to you evaluate the spherical aberration? Is it by means of a star test? As I already wrote I have got the bigger version (VMC 110) and have no problems seeing the Cassini division and 1 equatorial band on Saturn at 140x (this was back in August). I also saw a lot of features on Jupiter in August. Here's a test report that looks similar to what you are describing. This scope looks like a, "piece of junk", but it may not be indicative of all VMCs out there. Misalignment will affect performance, regardless. On one site of focus on a star I have perfect collimation (at 128x magnifcation) but on the other side it is ever so slightly out of collimation. No, it's not the eyepiece. I've seen this. I believe it's a mechanical alignment problem. The focusing mechanism doesn't follow the optical alignment through focus. Mechanically it deviates slightly through focus forcing the miscollimation on one side of focus (or both sides). In focus, though, it is optically collimated pretty much. But, you may see some stray light off to one side. If you can imagine the mechanical axis is "looking" at the optical axis (and the diffraction artifact) at a small angle, even in focus. When you move up the mechanical axis, the mechanical axis deviates to one side of the optical axis causing the apparent misalignment when out of focus. I had this problem after I disassembled my MCT and put it back together incorrectly. A simple rotation of the primary mirror cell by 90 degrees put it back to it's factor setting with much better mechanical alignment. It fixed the intra and extra focus offset we see. Fixing the mechanical alignment solved the optical misalignment problem as I scroll through focus. The two axis, mechanical and optical, are more coincident with each other. But, what matters most is in focus optical collimation. Still, it bothers us to see the optical offset on either side of focus. I am not a big fan of the sub aperture corrector. Light has to travel through them twice, once in then back through off the secondary. Lot of room for error there and compounded error at that. Star testing these things can be tricky because the wavefront is not designed to be spherical as with a parabolic mirror. It has a unique design wavefront that approximates a spherical one, so it will look differently on both sides of focus. But, the design can be good, regardless, if executed well and even with a lot of higher order spherical aberration. Notice in the star test image above, the system looks over corrected in what is likely an under corrected system with a lot of primary spherical aberration coming off the primary mirror (which is why there is a corrector installed). As I understand it, the difference is higher order spherical aberration which can be quite severe without much image degradation. The final proof is in the in focus image. Edited by Asbytec, 22 October 2018 - 07:08 PM. 1. All I can say: I have a ,,snap-focus". There is only one focus position. 2. I haven't come around to buy a 5mm eyepiece (will give me 207x magnification) to check the in-focus star pattern. 3. To make out the airy disc and 1st ring at 128x (with my Vixen 8mm eypiece) or 138x (Sky-Watcher 7.5mm) is nearly impossible at that low of a magnification. 4. A cheap Cheshire collimation aid device from ebay is on its way to my telescope. Edit: thanks again for mentioning optical axis. As I said on one site of focus (in the centre of the eyepiece) perfect collimation. On the other site I have to nudge the star slightly out of the centreof the eypiece to see the same perfect collimation. Edited by Magnetic Field, 23 October 2018 - 01:03 AM. Maybe the sub-aperture corrector is missing. Are you shure it is there ? Misalignement between the primary and the secondary can give good centered infocus and off out of focus. 1. This looks really bad (http://rohr.aiax.de/VMC-95L_M-02.jpg). 2. I know I have the bigger version VMC 110 and therefore not easy to draw conclusions. But mine looks completely different. First it was really hard to make out any difference intra- and extrafocal on a star. I must also admit I bought a display item on purpose. Not only was it cheaper (the regular retail in the UK now for the OTA Vixen VMC 110 is £399 and I got it for £199) I also thought a display and ex-demonstration item may have been hand-picked. Edit: This is one of the biggest problems with mass produced catadioptrics and reflectors: consistency. Especially when you read a test report from someone who has a good sample (1 good sample out there in relation to 50 dogs). I think there is better consistency and quality control among refractors (at least ED-type and apochromats) and test reports and reviews give a fair representation of the quality. Edited by Magnetic Field, 23 October 2018 - 02:51 AM. Snap to focus is a good indicator. Really a 90mm mak will offer better views I've looked through a 95mm Vixen and it was terrible similar start test terrible SA didn't snap into focus. Ironic Vixen make superb refractors and even newts but the cats are of questionable quality even the 200's appear to be terribly corrected a good old meade or celestron sct is a better bet in my opinion. The VMC95 has an interesting design, but suffers because of rough assembly and some hideous "money-saving" measures. Most of this applies to "mass-market" MCTs too, even if their saving grace is a much simpler design. Edited by Hesiod, 28 October 2018 - 10:42 AM. 1. I think they missed a trick with the 95L. Instead what Vixen is providing is literally tat (if we want to believe test reports). 2. The VMC 95L in combination with the Vixen Mini Porta would qualify for a very strong and attractive ETX-90 contender. 3. What are the advantages at low magnification? The 95L still has a slow f/11 (compared to the 110L with f/9.4 which makes it also good for deep sky observing and this was a deciding factor when I bought my VMC 110L). Edited by Magnetic Field, 28 October 2018 - 02:59 PM. Compared to the SW 90/1250 MCT, the VMC95 is 200mm shorter and has a larger field stop (plus a nice flat field, but even the MC90 is reasonably flat to my eye); also, f/11 means that I can hit a 3mm exit pupil with a 32mm Plossl, values which are out of the possibilities of the MC90 (an OTA I have used mosly for DSOs, and with great joy). While the extra aperture of the VMC110 is "tasty", IME the difference about focal ratios is inconsequential for visual observations; I got the 95 only because it was on sale (while the 110 was not): both little VMCs have a rather absurd pricing and, out of sales, I would never purchase one. Even before, the 'good' ones were good, so the design in principle is fine - all they'd have to do is go down to the factory in China, and revamp things there to make sure all OTAs came out optically good. Whether they've actually done this, who knows. Perhaps they were reworking the VMC line, so made the decision to drop the VMC110L and improve the 95L... even in Japan these had a reputation of being very poor scopes, so it's hard to believe they haven't improved quality control over the years. The VCM 110 was the worst telescope I ever owned in my life, by far! I bought because I liked the way it looked and have always had good results with Vixen products. Big mistake! The telescope had spherical aberration in spades! Horrible! If I got the shadow of the secondary centered on one side of focus, it was way off on the other. The internal flip mirror broke immediately. The the cross-slots in the Phillip head secondary alignment screws rounded off immediately, making further adjustment impossible. Images were fuzzy, fuzzy, fuzzy at any power. This performance of this telescope reminded me of that of a toy store telescope. I sold it for a couple of bucks at a yard sale and felt lucky. I really wanted to like this telescope, because I liked (and still do) the way it looks. Avoid this one, and likely its smaller brother, at all costs! Edited by Steve Allison, 28 October 2018 - 07:33 PM. It is hard to believe Vixen ever offered this piece of junk in the first place. Didn't they ever look through one? I asked to Vixen.jp the meaning of "B" and their answer was that it stood for the fact that instead of 2 eyepieces the telescope is equipped with an eyepiece and a Barlow lens. 1. I think this is due to a slightly out of whack optical axis. I have the same problem (on one side of focus the star is perfectly centred and on the other side slightly out of tune). However, I have been told here on this very newsgroup (I think they are right) that this does not degrade the image in-focus. 2. I admit it the flip mirror is junk. I am planning to buy a diagonal. I bought a Cheshire collimation aid eypiece and the mirror is perfectly centred but not with the flip mirror (one cannot do much about it). 3. I do not believe in the star test any more (I don't think it can easily be done and helping one to derive numbers for spherical aberrations). I am more inclined to test the in-focus image (although even then no one can say anything specific about spherical aberrations) (post #170 in this thread: https://www.cloudyni...-scope/page-7). How did you test your VMC 110L for spherical aberrations? 4. As a said I am glad I bought it and it gave me very good views of Mars, Jupiter, Saturn, Moon and Deep Sky objects this August. I have almost never criticized a telescope on this forum, but I made an exception for the VMC110. I have been observing for over 50 years and have star-tested telescopes the traditional (and correct) way dozens of times. This Vixen had an extremely bad star test and the images it produced were equally bad. Trust me, I know how to perform a star test. In the VMC110, the images inside and outside of focus looked nothing alike, and even a newbie to star testing would have been able to tell something was very wrong. Maybe the 95mm versions are better. I hope certainly so. Maybe those people within Vixen a completely bonkers. Could be. 1. Vixen could have walked down the easy route by slapping their good name (from the past) on to a re-labelled Sky-Watcher Maksutov that rolls out from a great many of the Chinese factories. And they could have called it a day. 2. What they did instead they went the extra mile and they come up with a new design. This means optical engineers must have spent time and research and development money for designing a new system. ,,BTW, the Klevtsov design is slightly different from Vixen VMC. While the Kletsov uses a mangin mirror (reflecting surface on the back of a correcting lens), the Vixen uses a traditional convex secondary with one or two element correctors in the front. 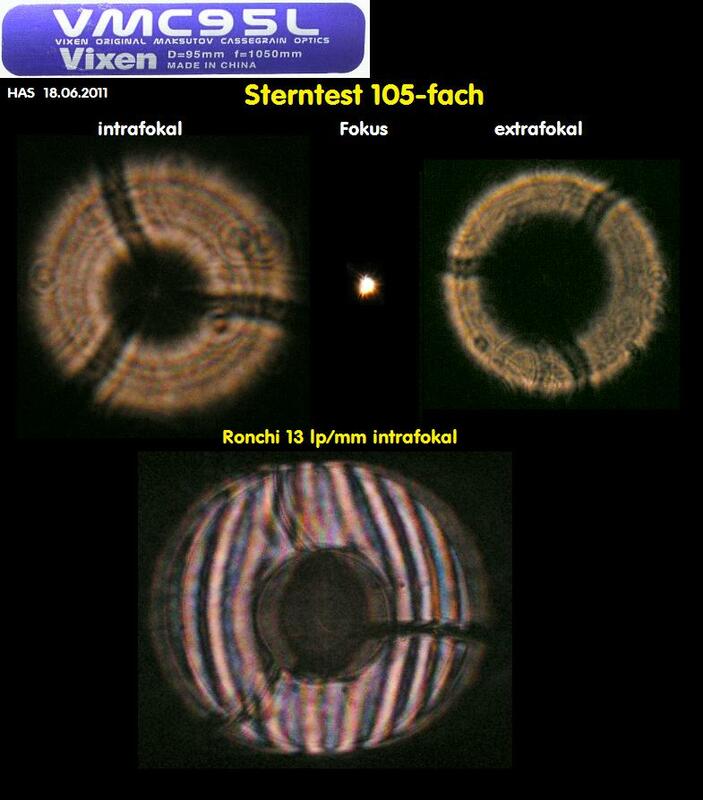 Vixen VMC is essentially a Shafer-Maksutov design featured in Telescope Making magazine many years ago. I think there is a 20" Shafer-Mak in UK. Google Shafer-Maksutov and you will probably find that link." 4. And Vixen stops there or what? And don't care any more what comes out of their design once it has left a Chinese factory. This defies believe. 5. I hope no one is sitting in the Vixen headquarter at the moment and wondering: oh Jesus why don't our VMCs not sell and have got such a bad reputation. Edited by Magnetic Field, 29 October 2018 - 01:34 PM.